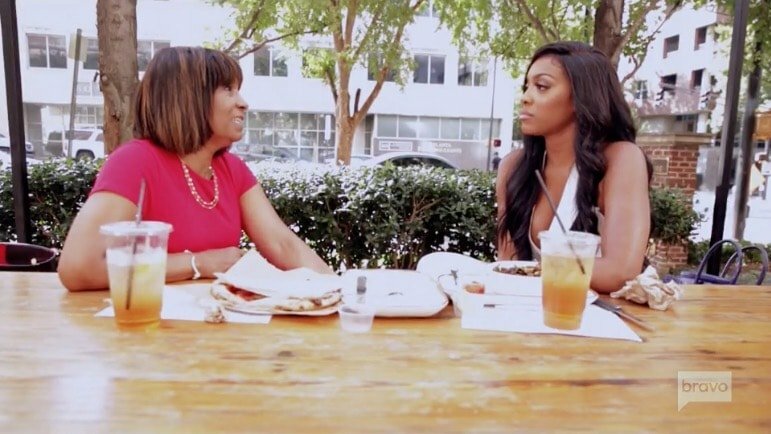 Real Housewives Of Atlanta Preview: Mama Joyce Confronts Porsha Williams! After a hiatus for the Super Bowl that left us on a ‘to be continued…‘ cliffhanger, Real Housewives Of Atlanta is back tonight. When we left off Cynthia Bailey had just discovered that her new beau Will possibly lied about having a girlfriend, and had been two-timing her all along. The news was dropped by NeNe Leakes‘ friend (and new ‘friend of’) Eva Marcille, a newcomer to Atlanta but certainly no neophyte when it comes to causing drama. Tonight Cynthia continues to deal with the fallout from Eva’s accusation — which is exacerbated when Porsha Williams‘ also makes an allegation about Will’s behavior! Speaking of accusations and allegations, Mama Joyce confronts Porsha about the gossip she spread about Kandi Burruss last year. Meanwhile Kenya Moore receives some news that could drastically alter the trajectory of her life – and will make her reevaluate her priorities. Trying to mend fences with the group, Porsha hosts a vegan dinner party where Marlo Hampton makes a startling comment about Kim Zolciak! Despite the upheaval Cynthia decides the perfect way to for the ladies to connect and forget their troubles is with a trip to Spain, and enlists NeNe’s help in planning the trip. Unfortunately there is a last minute cancellation and someone decides not to come along! Join Reality Tea in discussing the episode in the comment section below, and make sure to check out out recap tomorrow morning! TELL US – WILL MAMA JOYCE MAKE AMENDS WITH PORSHA? SHOULD CYNTHIA GIVE WILL ANOTHER CHANCE? Real Housewives Of Atlanta Recap: Kim Without Kroy?